An asteroid that passed within 3.7 million miles from Earth last year has turned out to be not one object, but two. 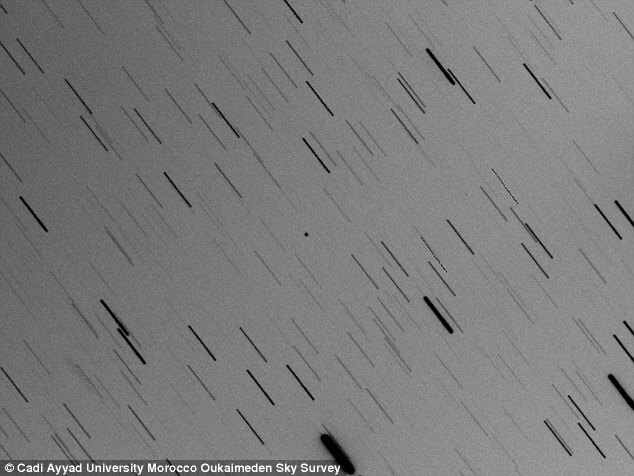 Asteroid 2017 YE5 was first spotted on Dec 21, 2017 by the Morocco Oukaimeden Sky Survey, and made its closest approach to Earth last month, on June 21. Observations during its close flyby, when it was about 16 times the distance between Earth and the moon, revealed it to be a binary system made up of two 3,000-foot objects orbiting each other. NASA has released what it says are the most detailed images taken yet of the near-Earth system, revealing how the two space rocks dance around each other. The experts say the binary asteroid won’t come this close to Earth for another 170 years. While it’s clear from the latest observation that 2017 YE5 is, in fact, two objects, it’s easy to see how it could be mistaken for one at some angles. When viewed head on at certain points in their orbits, the two align to appear as a single, albeit lumpy, space rock. ‘On June 21 and 22, observations by NASA's Goldstone Solar System Radar (GSSR) in California showed the first signs that 2017 YE5 could be a binary system,’ NASA explains. ‘The observations revealed two distinct lobes, but the asteroid's orientation was such that scientists could not see if the two bodies were separate or joined. Further observations at the Arecibo Observatory in Puerto Rico and the Green Bank Observatory in West Virginia independently confirmed the discovery. According to NASA, the two asteroids have a number of unique characteristics. Unlike typical rocky asteroids, they are ‘as dark as charcoal,’ meaning they don’t reflect as much light. It’s also thought they may differ in density, surface composition, or roughness, as the team found ‘striking differences’ in radar reflectivity between the two. This, NASA says, has never been seen the more than 50 other binary systems studied in the last 18 years. And, it’s even rarer considering the large size of each object. ‘Contact binaries, in which two similarly sized objects are in contact, are thought to make up another 15 percent of near-Earth asteroids larger than 650 feet (200 meters) in size,’ NASA says. Researchers say the discovery could help us to understand these unusual systems and how they form.